Spanish armor or corselet of the 16th century. Home » Spanish armor or corselet of the 16th century. Spain Armor of the sixteenth century. Spanish armor or corselet of the sixteenth century. Spain Renaissance. 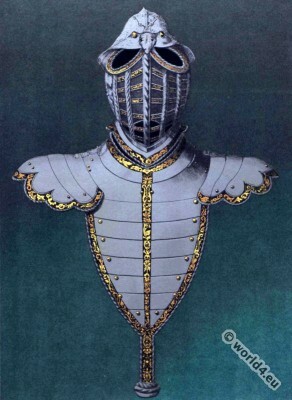 Middle armor or corslet of the sixteenth century. España. Media armadura ó corselete del siglo XVI. This entry was posted in 16th Century, Military, Renaissance, Spain and tagged Arte Decorativo, Renaissance fashion era, Weapons on 2/9/15 by world4.